As can be seen in this picture rows 17-21 are outlined in gray. I assume those are the Premium Economy seats. What is row 16 for? I'd expect business and first to be cordoned off so I'm guessing it's neither of those. This is of some relevance because I usually do two carry-ons. One goes in the overheard compartments and one goes underneath the seat in front of me. If there's a barrier in front of me cordoning off Premium Economy from Business or First or whatever I'd just as soon not be in that seat, since I'd then have to put both my bags in the overheard compartments. 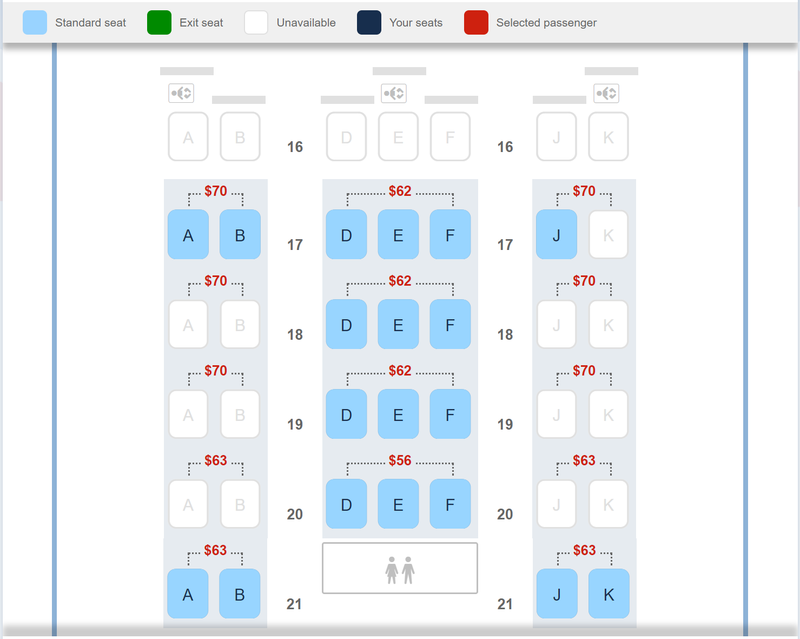 The image makes it look like these barriers are in front of row 16 but if row 16 isn't Premium Economy I'd kinda expect the barriers to be in front of row 17, in spite of the way the picture depicts them. I believe that everything you see in that image is in fact all of premium economy. What you are seeing with the prices, $62 etc is the latest airline scam - after buying your ticket you can pay even more for a supposedly "better" seat - but that's strictly meaning within your section. Furthermore notice in fact they ALL have prices: this is the latest variation of that scam: you have to pay for any known reserved seat selection. Note too: the last I flew with them (it changes all the time), BA has a confusing system where you can pay to select a specific seat (just as you show) but I think when it comes to 24? 12? hours before hand, you can then pick one ("of those remaining") for free. And indeed when you simply arrive and book in you can just pick one of the remaining. it will give you total information on the topic you are asking about. On truly long flights (and that's you!) it's worth having a look sometimes. Row 16 is blocked off from seat selection because British Airways reserves those seats in case of families needing baby baskets - if they remain unselected by an airline agent for that purpose, they are released for selection 48-72 hours prior to the flight. BA do this for Business bulkhead seats as well, its not just Economy or Premium Economy, and selecting that seat costs nothing in addition to any of the other seat prices, you just have to wait for them to be released.